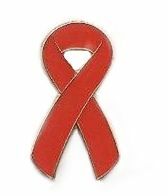 Our AIDS Awareness ribbon pins are one of our most popular items. These pins are quality crafted. They each measure 1"x3/4". This pin is a Red Ribbon for AIDS Awareness. Great for fundraising! We can also custom make these pins in quantities of 100 or more for the same price, but there is an additional $40 mold fee. Takes three weeks for custom orders, call for details. 1-866-982-3524.